If you only need to show plain text in an item, consider using QGraphicsSimpleTextItem instead. Note: QGraphicsTextItem accepts hover events by default. You can change this with setAcceptHoverEvents(). See also toHtml(), hasFocus(), and QGraphicsSimpleTextItem. If b is true, the Tab key will cause the widget to change focus; otherwise, the tab key will insert a tab into the document. 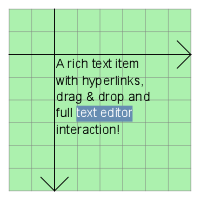 See also tabChangesFocus(), ItemIsFocusable, and textInteractionFlags(). The default for a QGraphicsTextItem is Qt::NoTextInteraction. This function also affects the ItemIsFocusable QGraphicsItem flag by setting it if flags is different from Qt::NoTextInteraction and clearing it otherwise. Returns true if the Tab key will cause the widget to change focus; otherwise, false is returned. By default, this behavior is disabled, and this function will return false.